It was brought to our attention recently that Rick Cluff, host of the CBC’s Vancouver morning show “Early Edition,” had a segment on this year’s ParticipACTION Report Card on Physical Activity for Children and Youth. Rick spoke with Allana LeBlanc, an exercise physiologist, who works with ParticipACTION. Here are some of the main points we were able to take away after listening to the podcast ourselves and looking at the highlights from the ParticipACTION report. The report explains that children need 60 minutes a day of physical activity, but their surveys on how much activity kids (5-17 years old) actually get indicate that only 9% of Canadian children meet the criteria. This is a complex situation because it’s not just about the lack of physical activity, but the increase in sedentary behaviour. Kids just aren’t moving around like they used to with more access to television and video games. One of the findings of the report is an increased fear of allowing children to play outdoors unsupervised. We want to protect our kids and keep them safe from harm. Yet, when our children do play outside unsupervised, they take more risks, independence increases and physical and social skills can improve. There is a difference between “danger” and “risk” and certainly no one is advocating dangerous or reckless behaviour. But children need to be allowed a certain amount of freedom to test their personal boundaries. ParticipACTION has also written a “Position Statement on Active and Outdoor Play,” and makes recommendations for children to have access and freedom to outdoor play and to play in nature, in all childhood situations from home to day care to school. This statement applies to all children from 3-12 years old. Children who play outdoors, in a natural playground that includes dirt and sticks, are more active than when playing on a pre-fabricated playground. In fact, children who take PE outside, are more active than when they play indoors. Sometimes we think it’s safer and healthier to keep our children inside where we can closely supervise them. But it’s not. There are many risks to staying indoors: our children will not learn the fundamental movement skills of running, kicking, throwing and jumping. They need these skills for their healthy growth and development; without physical activity, there is an increased risk for health concerns down the road. We need to teach our kids positive health habits for their life time. Click here to hear the original CBC podcast. We’re very fortunate at Ridgeview to have a natural playground. Located beside our adventure playground, the natural playground has a variety of shrubs; a long, shallow, meandering creek with slow moving water and rocks for crossing, and large trees with overhanging branches providing shade and cooler temperatures during these warm days. In the beginning of the school year, our classes use only the adventure playground during the morning and lunch recess, with adult playground supervisors in attendance. When school starts in September, we typically have 40-44 four- and five-year old children between our two classes. Since the full-day Kindergarten program started, our children have their own recess time in the morning, after Grades 1-7 have finished their playtime. We’re fortunate to have school administration who understand the needs of young children and have specifically allotted resources to enable this to happen for the entire school year. The children still have their lunch recess with the rest of the school and when we take an afternoon recess playtime, we are often joined by some of the other classes. Our school population is currently > 400 students. As part of learning to play, inside or outdoors, we establish classroom rules and routines, create a self-regulated classroom environment and directly teach the expectations and behaviour we want first, and we teach them as a whole group. Kindergarten children come to us with a wide variety of preschool, daycare and home experiences. Kindergarten is the first opportunity to develop a constant model for self-regulation and behaviour for the next eight years at our school. Our teaching experience has taught us that when we have the respect, rules and safety expectations in place, then our students can have freedom within those boundaries, and we can all have a fun and enjoyable time. 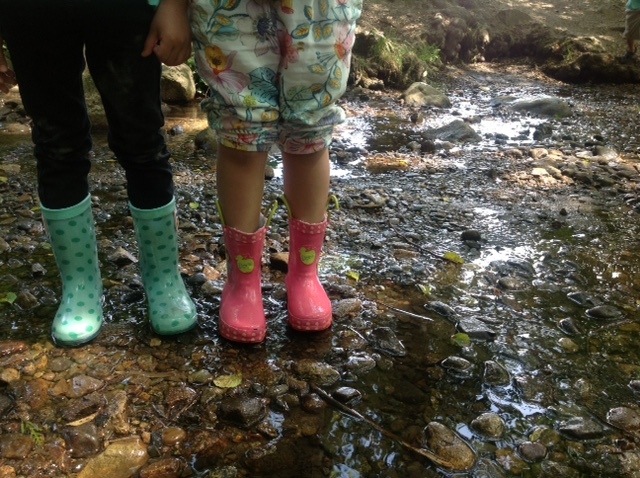 Our only rule for the natural playground is that the children who want to play in the creek wear their rain boots, so they can still have dry socks and shoes to wear in class. You’d be impressed to see how quickly children can change their shoes and boots when the recess bell rings. Now here we are in June, and we’ve seen some amazing outdoor play. We’ve seen children crossing the rocks across the creek, arms outstretched for balance. Children are scrambling up the banks of the creek, clinging to shrubs. We have children endlessly filling up and emptying containers and ziploc bags with creek water. We noticed that a group of children has engineered a shallow trough down the length of the creek, right in the middle. We see children running, jumping and negotiating their way around big tree roots. Yes, we’ve had some tumbles and lots of scrapes, but nothing that a hug, a band-aid and a drink of water couldn’t fix. And we also know that the closer the connection our children have to nature and the outdoors when they’re young, the more likely they will want to protect and look after their environment when they grow up. This entry was posted in Kindergarten Basics, Play by thekinderteam. Bookmark the permalink. It’s been a glorious summer here in Vancouver and we’ve certainly been taking advantage of all this holiday time has to offer to play. We know that children need lots of time for unstructured play where they can use their imagination, explore and engage in conversations with others. Well, what about adults? We need unstructured play time as well. It’s not just about sports and physical activity, although a lot of people might default to that definition. What other kinds of activities can we do which allows our thoughts and ideas to roam free, where we might use our creativity? Since the beginning of April, we’ve been playing in our gardens, designing, planting and caring for our plants. We both love perennials, but the hot summer weather has made looking after them very challenging. We’ve been resourceful with our limited water supply for the plants (using partially finished glasses of water and water bottles, and recycling the old ice from the ice maker in our freezers), while allowing the grass to go dormant. It’s been a joy to visit the gardens of family, friends, parks and the community and see the creativity and love that’s been poured into these welcoming spaces. We’ve been playing in our homes, cleaning from top to bottom and purging unnecessary items. After our end-of-the-school-year “classroom clear out,” we often find it hard to relax right away so we carry that energy into our houses and start sorting, organizing and tossing. Although not everyone enjoys this kind of activity, we find it extremely therapeutic. A lot of stress seems to subside when there is less to maintain and clean. We’ve been painting, rearranging furniture and decorating to ensure every room is a calm and peaceful place to be. We’ve been playing hard in the kitchen. Cooking for teenagers, particularly a teenage son who resembles an eating machine, is endless. The teenagers can’t help it if they’re hungry all the time; they’re growing and playing hard themselves. So the past few weeks our kitchen has seen some intensive cooking and baking lessons for the teenagers, as well as the advanced “washing/drying/loading the dishwasher with everybody’s dishes, not just your own” course. We’ve only had a few mishaps: sorting out the differences between “muffin method” and “cake method” mid recipe; no texting while frying; and going from “golden” to “burnt” can happen quickly if you’re not being mindful. It’s actually been really fun and we’ve shared a lot of laughter. There’s been lots of other kinds of playing going on as well. We’ve had a lot of music being sung and played on instruments. We’ve been drawing and crafting. Even writing this blog post is playing–with words, phrasing and humour. So what is play? Something we do, or a state of mind? Below is a reblog of an earlier post we wrote, on the importance of outdoor play for our children. I really enjoyed this article and was quite shocked to see that only 9% of children in Canada meet the daily physical exercise criteria. Physical exercise and outdoor play are so integral to development yet many of today’s children are living very structured lives. In Toronto, it seems that so many children have such packed schedules. From gymnastics to music lessons to soccer practice, where is the time to gain some independence and have the freedom of choice? Although these certainly are wonderful activities, there needs to be a balance of structured play/learning and free play. Looking back on my childhood, my fondest memories were of my times at the Waldorf Academy. It was a technology free school that integrated nature and lessons on a daily basis. I remember taking weekly Friday hikes with my class and feeling so close to my classmates and teachers. Time in nature is essential to develop confidence, independence, and a connection to something other than Wi-Fi!